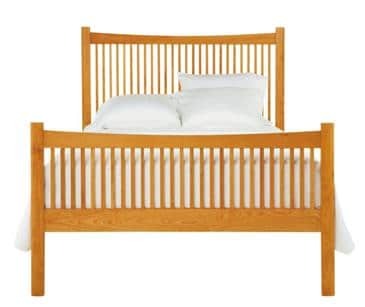 Vermont Heartwood Cherry Bed | Maple, Cherry, Walnut wood | Buy now! Our Heartwood Collection is designed for customers looking for a contemporary, slightly Art Deco look for their furnishings. The Heartwood Collection’s basic design is inspired by Vermont Furniture Designs’ Mission Collection, but with a softer, rounder look. Legs and the undersides of tops have rounded lines for a solid, yet elegant appearance which coordinates with many decorating styles. We make parts in multiples, but each piece of furniture is bench-crafted by a small team of Vermont Craftsmen. Everyone on our team is a quality-control person, and parts and furniture can be rejected at any time. This results in an old-world look with a high degree of quality and durability. We are considered the top quality vendor by all of our wholesale customers, and this is backed up by a return rate near zero. We feel comfortable comparing our furniture with pieces costing two to three times as much – Vermont Furniture Designs produces a great value!